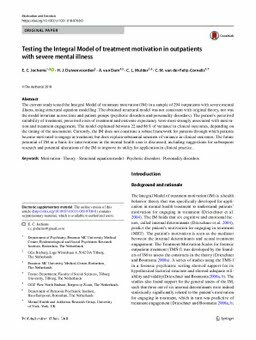 Abstract: The current study tested the Integral Model of treatment motivation (IM) in a sample of 294 outpatients with severe mental illness, using structural equation modelling. The obtained structural model was not consistent with original theory, nor was the model invariant across time and patient groups (psychotic disorders and personality disorders). The patient’s perceived suitability of treatment, perceived costs of treatment and outcome expectancy were most strongly associated with motivation and treatment engagement. The model explained between 22 and 86% of variance in clinical outcomes, depending on the timing of the assessment. Currently, the IM does not constitute a robust framework for patterns through which patients become motivated to engage in treatment, but does explain substantial amounts of variance in clinical outcomes. The future potential of IM as a basis for interventions in the mental health care is discussed, including suggestions for subsequent research and potential alterations of the IM to improve its utility for application in clinical practice.